The facility is all yours! Customers are responsible for all food and party supplies. Up to 15 children per party….$5 each additional child after 15. Staff will be present during the swimming activities. Clean up is provided by our staff. Let us do the work! We supply pizza, juice/water, utensils, plates, cups, and napkins. 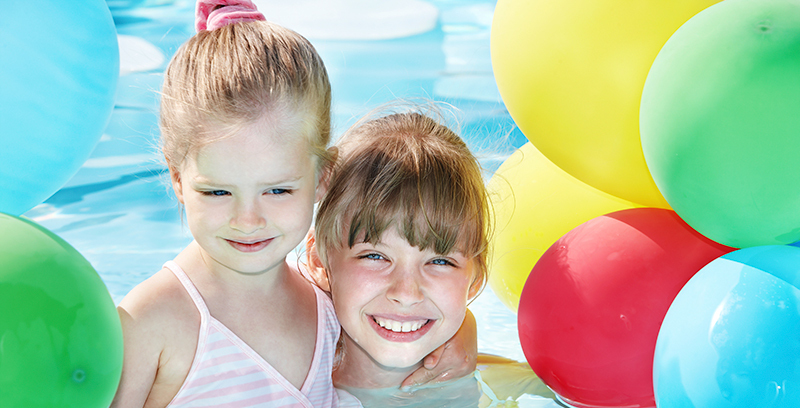 Up to 15 children per party….$5 each additional child after 15. Price includes 3 large pizzas. Additional pizzas can be ordered upon request for $20 each. Staff will be present during the swimming activities. Clean up is provided by our staff. *The two hour reservation consists 75 minutes in pool area and 45 minutes in private party room. Customers must supply their own towels. Please submit special songs or game requests prior to party (iPhone access available). Customers may supply decorations (must be approved), cake, ice cream, or goodie bags. There is a non-refundable deposit of $75 to schedule your party due at time of reservation. Additional time can be arranged in advance at $100 per hour. Parties must be completely finished at the designated end time, as the staff must clean for additional parties. A $50 late charge will apply for parties that go over. Monday – Thursday Lessons: 9:00 a.m. to 7:30 p.m.
Sunday Lessons: 9:00 a.m. to 1:00 p.m.
Sunday Swim Parties and Banquets: 1:30p.m. – 6:00p.m.